For more information including graphs and a downloadable petition, click here. What is driving these trends, and is this sustainable? 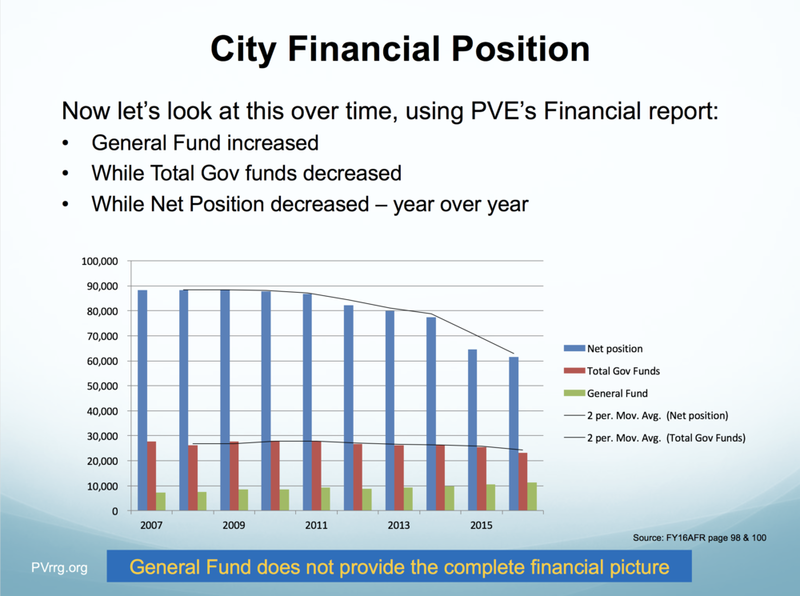 In March 2017, Council discussed a liability incurred by PVE when CalPERS changed discount rat. Council also commented that further reductions in discount rate are expected. This growth is concerning because PVE population has been flat for last 10 years, and PVE income has been flat (after adjustment for CPI increases). Many residents on fixed incomes. 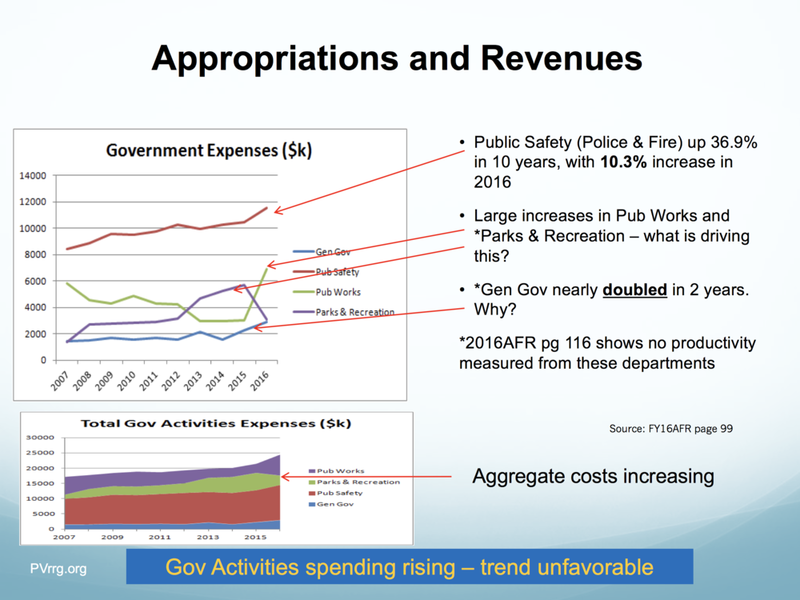 Public Works has increased 71% from $1.26 M to $2.15 M.
If expenses had been held to inflation over that period, $2.1 M in relief from the Parcel (Fire) Tax would have been captured. This is 47% of the current expenditures on Fire $4.5 M. So we’d be halfway there. For more analysis of the Parcel Tax, click here. On April 25th, 2017 at 7:30 pm, the Palos Verdes Estates City Council will discussing its financial options in the aftermath of Measure D not passing. This regular City Council meeting will be held in City Council Chambers and the public is invited to participate. For the agenda and supporting documents, click here. Our research into local government best practices has led us to very interesting ideas from organizations such as the Institute for Local Government (ILGA), (see the following link to their informative website about the importance of Public Engagement in various aspects of government including budgeting and decision making around public spending). For more info, click here. One article included on the website is entitled “Public Engagement in Budgeting” which makes the argument for involving the public in this process for better public acceptance, and describes various approaches that can be utilized. Of these approaches we favor the creation of a Community Based Financial Advisory Committee to utilize the high level of knowledge and expertise that exists among Palos Verdes Estates residents. Involving knowledgeable members of the public in this way also provides an enhanced opportunity for Council oversight of city spending. This Committee would work together with the City Treasurer and key members of the City staff to explore opportunities and make recommendations on opportunities to improve the City’s financial health. Recognizing that there are significant financial challenges ahead, we believe it’s incumbent upon the Council to ensure that every opportunity for cost savings and efficiency has been explored. While it’s often helpful in these sorts of situations to engage objective, outside experts and consultants in this type of effort, we believe that this is potentially another opportunity for public engagement where the appropriate expertise exists in the community. For example, many residents have worked in corporations that have had to address the need for cost-cutting and right-sizing when business conditions have changed. This experience could be applied to reviewing many of the city’s functions and departments. On the other hand, there are some functional areas that are so unique to government, such as public safety, that employment of an outside expert would be helpful in assessing whether resources are allocated most efficiently. For example, is the ratio of uniformed police officers to office staff consistent with benchmarks that exist for other similarly sized communities? Are there efficiencies that could be achieved that would not affect either public safety or public confidence in our police department? Consider establishing this mechanism as part of the Financial Advisory Committee or as a separate advisory body. Often linked to the goal setting process is the establishment of key performance indicators or metrics to measure both the “what and the “how”, i.e. “what” needs to be accomplished as well as the quality of the accomplishment (the “how”). In addition to measuring goal attainment, these metrics are also very important in first establishing and then assessing the on-going appropriateness of staffing levels. As with Recommendation 2, this Performance Measurement review could be conducted by the Financial Advisory Committee or by a separate advisory body. Recommendation 4 – Make and announce changes that demonstrate to the public a willingness to embrace engagement, and not just transparency. Provide a mechanism for residents to comment on statements made on the City’s “fact-check” page. Too often, the statements made by the City are misleading and this defeats the purpose of a page intended to clarify and enlighten. Conduct facilitated workshop sessions for residents on important topics of interest to provide opportunities for information sharing, discussion and feedback that can be longer than the three minute resident speech limit in Council meetings.